The following document was released by the U.S. Navy on February 24, 2014. The United States is an Arctic nation through the state of Alaska and its surrounding territorial and Exclusive Economic Zone waters located in and around the Arctic Circle. The United States Navy, as the maritime component of the Department of Defense, has global leadership responsibilities to provide ready forces for current operations and contingency response that include the Arctic Ocean.2 The Arctic Region3 remains a challenging operating environment, with a harsh climate, vast distances, and little infrastructure. These issues, coupled with limited operational experience, are just a few substantial challenges the Navy will have to overcome in the Arctic Region. While the Region is expected to remain a low threat security environment where nations resolve differences peacefully, the Navy will be prepared to prevent conflict and ensure national interests are protected. In the coming decades, the Arctic Ocean will be increasingly accessible and more broadly used by Arctic and non-Arctic nations seeking the Region’s abundant resources and trade routes. Due to the significant retreat of sea ice, previously unreachable areas have started to open for maritime use several weeks each year. The predicted rise in oil and gas development, fishing, tourism, and mineral mining could alter the Region’s strategic importance as Arctic and non-Arctic nations make investments. Despite this gradual ice opening, the Region’s frequent harsh weather and sea conditions are significant limiting factors for Arctic Ocean operations. • Prepare for a wide range of challenges and contingencies. • Promote partnerships within the United States Government and with international allies and partners. 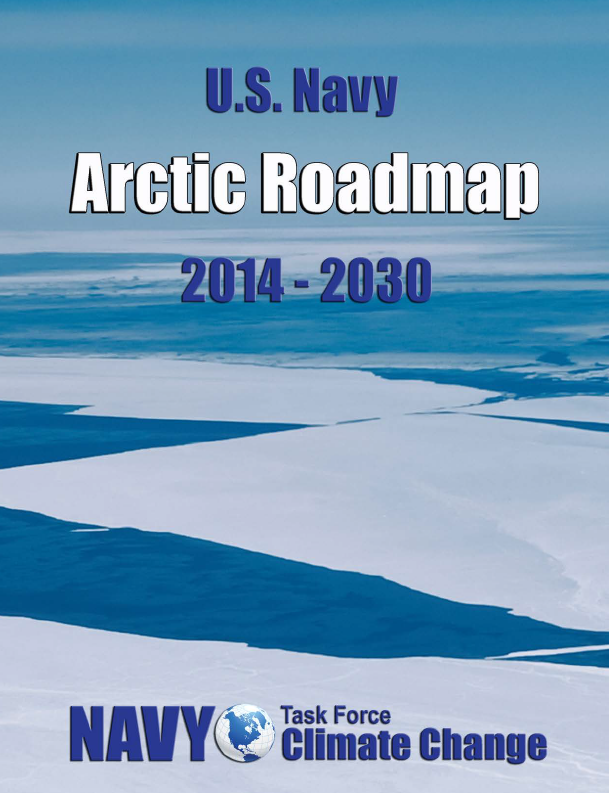 This Roadmap provides direction to the Navy for the near-term (present-2020), mid-term (2020-2030), and far-term (beyond 2030), placing particular emphasis on near-term actions necessary to enhance Navy’s ability to operate in the Arctic Region in the future. In the near-term, there will be low demand for additional naval involvement in the Region. Current Navy capabilities are sufficient to meet near-term operational needs. Navy will refine doctrine, operating procedures, and tactics, techniques, and procedures to guide future potential operations in the Arctic Region. In the mid-term, the Navy will provide support to the Combatant Commanders, United States Coast Guard, and other United States Government agencies. In the far-term, increased periods of ice-free conditions could require the Navy to expand this support on a more routine basis. Throughout these timeframes, the Navy will continue to develop and enhance cooperative relationships across the Department of Defense, United States Government agencies, industry, and international allies and partners. The Arctic is warming faster than the rest of the globe. In the past 100 years, average Arctic temperatures have increased at almost twice the global average rate. Average Northern Hemisphere temperatures during the second half of the 20th century were very likely higher than during any other 50-year period in the last 500 years. In 2012, Arctic sea ice reached its smallest extent in recorded history, 1.3 million square miles. The reduction in ice extent has led to an increase in human activity, in resource extraction, fishing, and tourism. Nevertheless, any endeavor in the Arctic Region will have to overcome environmental challenges in the coming decades as the region warms and the ice continues to recede. With less sea ice cover, the ocean absorbs more heat from the sun during summer, increasing the temperature contrast between the warm ice-free ocean and cold ice surfaces in autumn. This increase in temperature contrast could lead to the development of more frequent and more intense Arctic cyclones. The stronger thermal contrast may also lead to increased likelihood of fog. The impact of reduced sea ice on Arctic weather patterns remains an area of great uncertainty. Reduction of Arctic Ocean sea ice is expected to continue, and major waterways will become increasingly open. By 2020, the Bering Strait is expected to see open water conditions up to 160 days per year, with 35-45 days of shoulder season. The Northern Sea Route (see Fig. 5) will experience up to 30 days of open water conditions, with up to 45 days of shoulder season conditions. 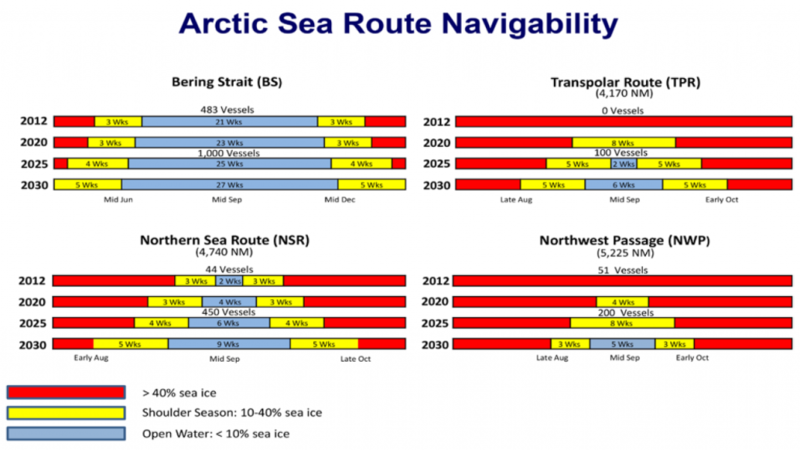 Analysis suggests that the reliable navigability of other routes, including the Transpolar Route and the Northwest Passage, is limited in this timeframe. There will be shoulder season route variability based upon ice age, melt, and movement. This period will see increasing levels of ice melt and increasingly open Arctic Ocean waters. By 2025, the Bering Strait will see up to 175 days of open water (and 50-60 days of shoulder season). These figures increase to 190 days of open water (and up to 70 days of shoulder season) by 2030. For the Northern Sea Route, predictions are for up to 45 days of open water (with 50-60 days of shoulder season) by 2025, increasing to 50-60 days of open water by 2030 (with up to 35 days of shoulder season conditions). This period will begin to see greater accessibility of the Transpolar Route, which is forecast to be open for up to 45 days annually, with 60-70 days of shoulder season. Analysis suggests the reliable navigability of the Northwest Passage will continue to remain limited in this timeframe. In the far-term, environmental conditions are expected to support even greater and more reliable maritime presence in the region. Major waterways are predicted to be consistently open, with a significant increase in traffic over the summer months. The Northern Sea Route and Transpolar Route should be navigable 130 days per year, with open water passage up to 75 days per year. The Northwest Passage will be increasingly open during the late summer and early fall.